For the purposes of TOGAF 9, the core concepts provided in this chapter apply. TOGAF is an architecture framework. TOGAF provides the methods and tools for assisting in the acceptance, production, use, and maintenance of an enterprise architecture. It is based on an iterative process model supported by best practices and a re-usable set of existing architecture assets. 2.2 What is Architecture in the Context of TOGAF? TOGAF considers the enterprise as a system and endeavors to strike a balance between promoting the concepts and terminology of ISO/IEC 42010:2007 - ensuring that usage of terms defined by ISO/IEC 42010:2007 is consistent with the standard - and retaining other commonly accepted terminology that is familiar to the majority of the TOGAF readership. For more on terminology, refer to 3. Definitions and Part IV, 35. Architectural Artifacts. 2.3 What Kind of Architecture Does TOGAF Deal With? The Business Architecture defines the business strategy, governance, organization, and key business processes. The Data Architecture describes the structure of an organization's logical and physical data assets and data management resources. The Application Architecture provides a blueprint for the individual applications to be deployed, their interactions, and their relationships to the core business processes of the organization. The Technology Architecture describes the logical software and hardware capabilities that are required to support the deployment of business, data, and application services. This includes IT infrastructure, middleware, networks, communications, processing, standards, etc. The TOGAF Architecture Development Method (ADM) provides a tested and repeatable process for developing architectures. The ADM includes establishing an architecture framework, developing architecture content, transitioning, and governing the realization of architectures. All of these activities are carried out within an iterative cycle of continuous architecture definition and realization that allows organizations to transform their enterprises in a controlled manner in response to business goals and opportunities. The Preliminary Phase describes the preparation and initiation activities required to create an Architecture Capability including customization of TOGAF and definition of Architecture Principles. Phase A: Architecture Vision describes the initial phase of an architecture development cycle. It includes information about defining the scope of the architecture development initiative, identifying the stakeholders, creating the Architecture Vision, and obtaining approval to proceed with the architecture development. Phase B: Business Architecture describes the development of a Business Architecture to support the agreed Architecture Vision. Phase C: Information Systems Architectures describes the development of Information Systems Architectures to support the agreed Architecture Vision. Phase D: Technology Architecture describes the development of the Technology Architecture to support the agreed Architecture Vision. Phase E: Opportunities & Solutions conducts initial implementation planning and the identification of delivery vehicles for the architecture defined in the previous phases. Phase F: Migration Planning addresses how to move from the Baseline to the Target Architectures by finalizing a detailed Implementation and Migration Plan. Requirements Management examines the process of managing architecture requirements throughout the ADM.
Architects executing the ADM will produce a number of outputs as a result of their efforts, such as process flows, architectural requirements, project plans, project compliance assessments, etc. 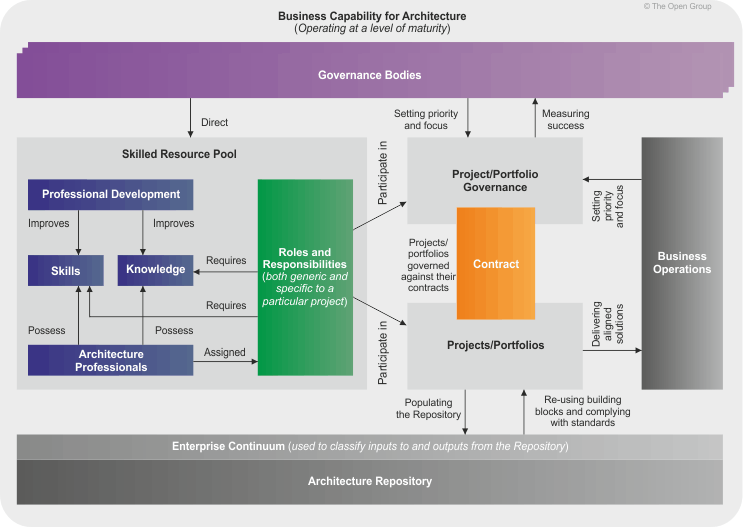 The TOGAF Architecture Content Framework (see Part IV, 33. Introduction) provides a structural model for architectural content that allows major work products to be consistently defined, structured, and presented. A deliverable is a work product that is contractually specified and in turn formally reviewed, agreed, and signed off by the stakeholders. Deliverables represent the output of projects and those deliverables that are in documentation form will typically be archived at completion of a project, or transitioned into an Architecture Repository as a reference model, standard, or snapshot of the Architecture Landscape at a point in time. An artifact is an architectural work product that describes an aspect of the architecture. Artifacts are generally classified as catalogs (lists of things), matrices (showing relationships between things), and diagrams (pictures of things). Examples include a requirements catalog, business interaction matrix, and a use-case diagram. An architectural deliverable may contain many artifacts and artifacts will form the content of the Architecture Repository. Architecture Building Blocks (ABBs) typically describe required capability and shape the specification of Solution Building Blocks (SBBs). For example, a customer services capability may be required within an enterprise, supported by many SBBs, such as processes, data, and application software. Solution Building Blocks (SBBs) represent components that will be used to implement the required capability. For example, a network is a building block that can be described through complementary artifacts and then put to use to realize solutions for the enterprise. 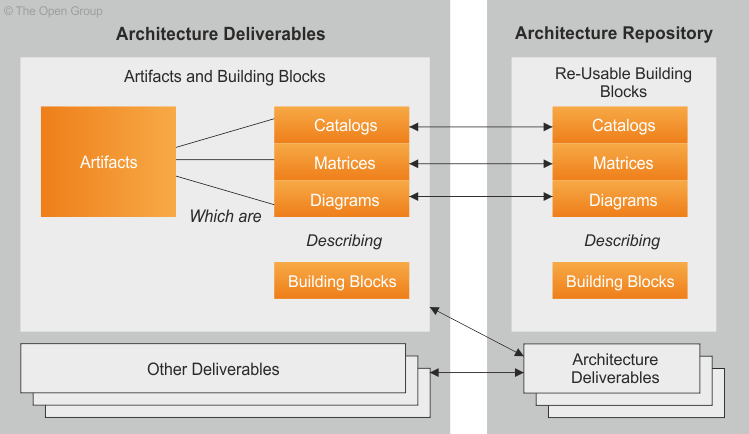 The relationships between deliverables, artifacts, and building blocks are shown in Figure 2-1. For example, an Architecture Definition Document is a deliverable that documents an architecture description. This document will contain a number of complementary artifacts that are views of the building blocks relevant to the architecture. For example, a process flow diagram (an artifact) may be created to describe the target call handling process (a building block). This artifact may also describe other building blocks, such as the actors involved in the process (e.g., a Customer Services Representative). An example of the relationships between deliverables, artifacts, and building blocks is illustrated in Figure 2-2. An overview of the structure and context for the Enterprise Continuum is shown in Figure 2-3. Supporting the Enterprise Continuum is the concept of an Architecture Repository which can be used to store different classes of architectural output at different levels of abstraction, created by the ADM. In this way, TOGAF facilitates understanding and co-operation between stakeholders and practitioners at different levels. By means of the Enterprise Continuum and Architecture Repository, architects are encouraged to leverage all other relevant architectural resources and assets in developing an Organization-Specific Architecture. In this context, the TOGAF ADM can be regarded as describing a process lifecycle that operates at multiple levels within the organization, operating within a holistic governance framework and producing aligned outputs that reside in an Architecture Repository. 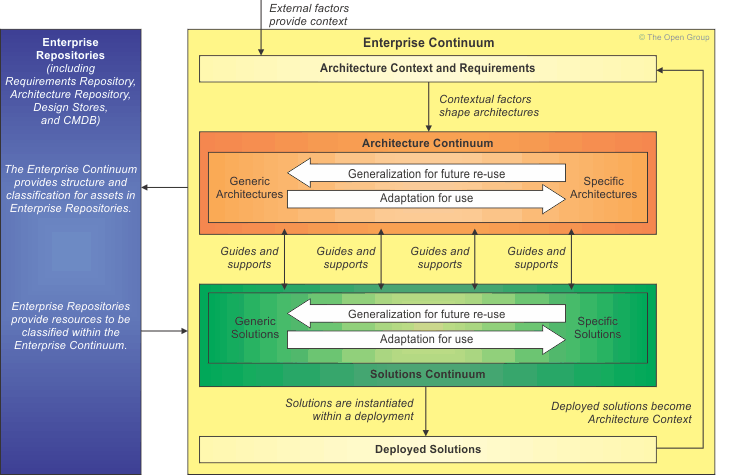 The Enterprise Continuum provides a valuable context for understanding architectural models: it shows building blocks and their relationships to each other, and the constraints and requirements on a cycle of architecture development. 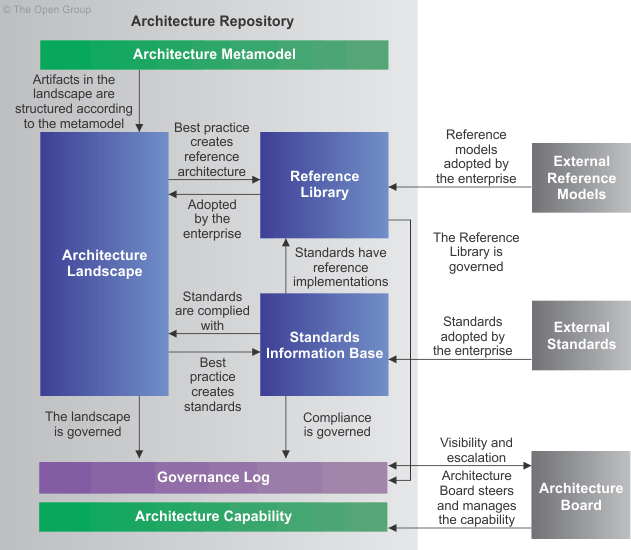 The structure of the TOGAF Architecture Repository is shown in Figure 2-4. The Architecture Metamodel describes the organizationally tailored application of an architecture framework, including a metamodel for architecture content. The Architecture Landscape is the architectural representation of assets deployed within the operating enterprise at a particular point in time. The landscape is likely to exist at multiple levels of abstraction to suit different architecture objectives. The Standards Information Base (SIB) captures the standards with which new architectures must comply, which may include industry standards, selected products and services from suppliers, or shared services already deployed within the organization. The Governance Log provides a record of governance activity across the enterprise. In order to carry out architectural activity effectively within an enterprise, it is necessary to put in place an appropriate business capability for architecture, through organization structures, roles, responsibilities, skills, and processes. An overview of the TOGAF Architecture Capability is shown in Figure 2-5. Central to the notion of operating an ongoing architecture is the execution of well-defined and effective governance, whereby all architecturally significant activity is controlled and aligned within a single framework. As governance has become an increasingly visible requirement for organizational management, the inclusion of governance within TOGAF aligns the framework with current business best practice and also ensures a level of visibility, guidance, and control that will support all architecture stakeholder requirements and obligations. Further detail on establishing an enterprise Architecture Capability is given in Part VII, 45. Introduction. Because TOGAF is a generic framework and intended to be used in a wide variety of environments, it provides a flexible and extensible content framework that underpins a set of generic architecture deliverables. As a result, TOGAF may be used either in its own right, with the generic deliverables that it describes; or else these deliverables may be replaced or extended by a more specific set, defined in any other framework that the architect considers relevant. In all cases, it is expected that the architect will adapt and build on the TOGAF framework in order to define a tailored method that is integrated into the processes and organization structures of the enterprise. This architecture tailoring may include adopting elements from other architecture frameworks, or integrating TOGAF methods with other standard frameworks, such as ITIL, CMMI, COBIT, PRINCE2, PMBOK, and MSP. Guidelines for adapting the TOGAF ADM in such a way are given in Part II, 5.3 Adapting the ADM.
As a generic framework and method for enterprise architecture, TOGAF provides the capability and the collaborative environment to integrate with other frameworks. Organizations are able to fully utilize vertical business domains, horizontal technology areas (such as security or manageability), or application areas (such as e-Commerce) to produce a competitive enterprise architecture framework which maximizes their business opportunities.